Ever have a shirt you love that’s too small? Here’s a way to make it fit. Find a knit shirt like a t-shirt or Henley shirt in a coordinating color with the same sleeve length. Cut a strip out of each side of the knit shirt. Be sure to keep the side seams. Center the side/sleeve seams in the middle of the strips you cut. 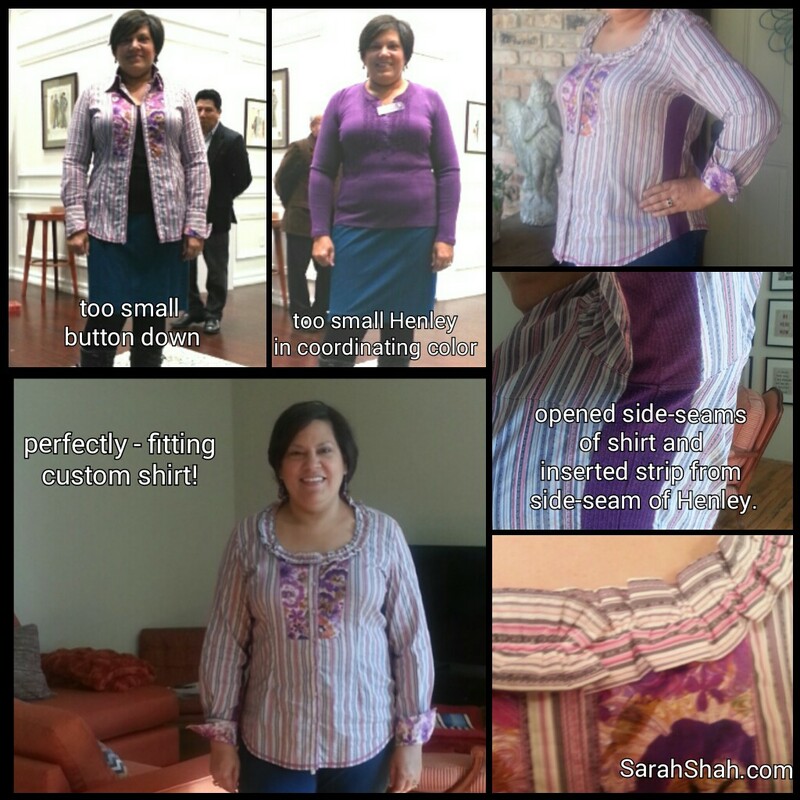 Insert the strips of the knit shirt into the side and sleeve seams of the “too small” shirt and sew them in place. Here’s an example of a George Roth shirt I modified. I’m not a fan of a shirt collar, I removed the collar, cut a scoop neckline and used the extra fabric to make a ruffle for the new neckline. I did this with the help of a tailor, but the project could be easily done as a DIY. Here’s a redo of a t-shirt. I love it! I’m going to try this on several shirts, I think. I might cut the sleeves short, too. I particularly like the way you mentioned the other mods you made to the shirt. Sometimes I forget that I can just fix things to be the way I want! So glad you like it Melissa! Yes, you can make the shirt any way you want…no point in settling, ever! I had this exact idea, but I hadn’t seen it done. Now I know it will work. Thank you! Great minds Rachel!! So glad I could help. How did you customize your shirt? My wonderful husband bought me a clearance button down online that is too small. Final sale, so I was going to give it away, but really don’t want to because I love the shirt. Thanks for figuring out how I can love the shirt on me, instead of just on the hanger! So glad you have a way to save the shirt you love Rachel!! I’d love to see how you made it work! I love this idea! I have so many button-downs that are a tad to small. This makes me wish I knew how to sew! Great job! I’m so glad you found it useful Megan! I’d love to see what you do to customize your button-downs!